2 natural-style wood handles are designed in unique triangle shapes that add visual interest and give this handbag a fun and modern look. Unsnap the side fasteners to create extra storage and exceptional look. This stunning tote bag is the perfect way to add a zing of bold, unique style to any outfit. Roomy main compartment with 2 pocket-style organizers on one wall, 1 zippered pouch on the other, and 1 large zippered pocket/partition through the middle that divides the space into 2 compartments. Approximate Dimensions: Exterior - 13" H X 16" W X 6" D; Interior - 12" H X 16" W X 5" D; Handle - 4" drop; Shoulder Strap - 26" drop. You're not afraid to be bold, feel fresh and fabulous with this enchantingly vibrant satchel handbag! So why not take a walk on the wild side with this unique and adventurous tote bag? 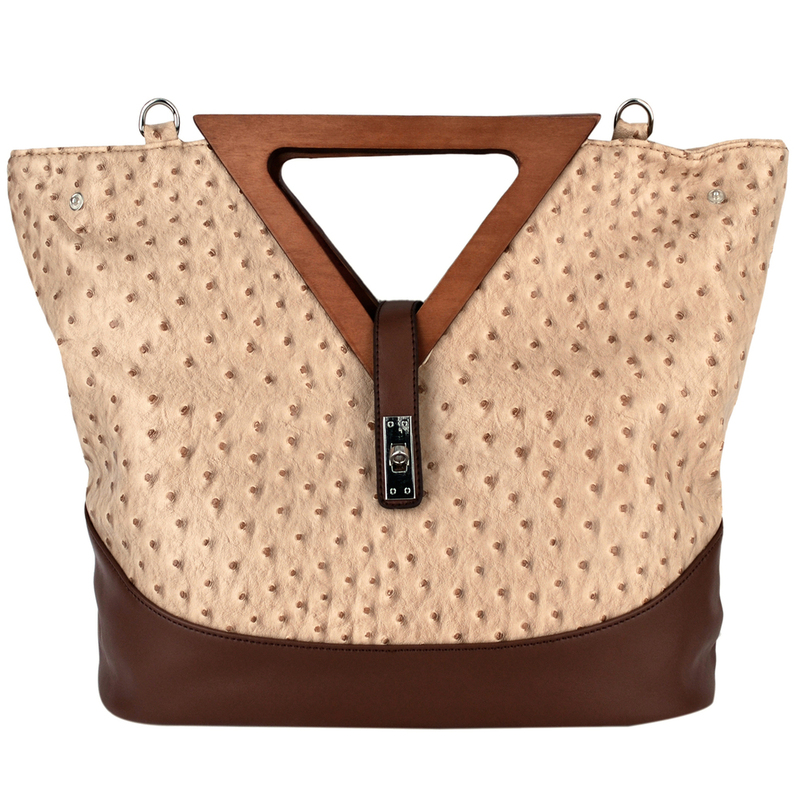 The modern and stylish shape of this hobo bag is perfectly combined with an exotic faux-ostrich texture and 2 triangular wood handles, all of which give this satchel a unique and attention-grabbing look. More than just a fashion statement, though, this double handle bag has a spacious and lined main compartment that includes 1 zippered pouch on one wall, 2 pocket-style organizers on the other, and 1 large zippered pouch / partition through the center. Just zip up the top closure and secure the top strap with its turn-lock latch on this top handle handbag, and everything you need securely stored by your side. Unsnap the side fasteners to create extra storage and exceptional look. Carry this fabulous shopping tote by the 2 wood handles or by the detachable shoulder strap, it's so versatile and that goes from day to night with such ease. For your daily dose of unique style, this magnificent shoulder bag is just what you need. Brighten every room you enter with the help of this exuberant beauty!